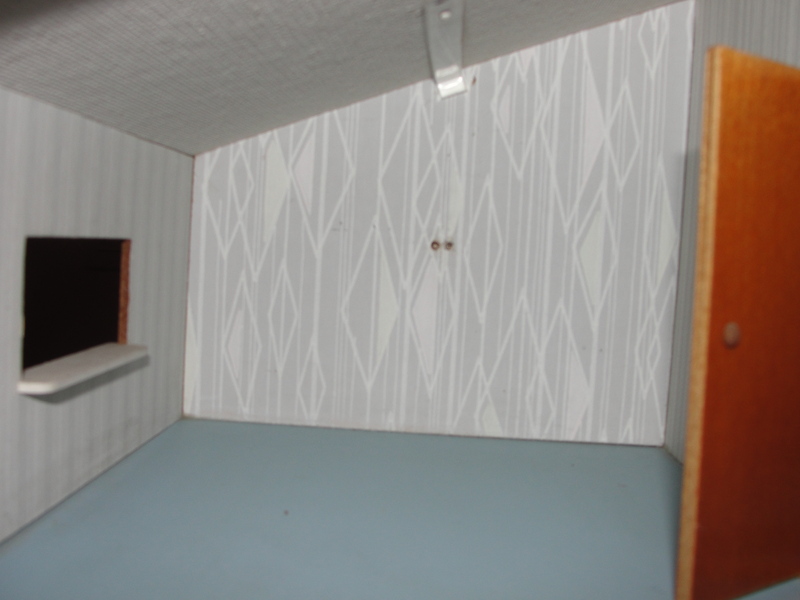 One of my fellow bloggers pointed out to me that this dollhouse was in fact a vintage Lundy dollhouse circa 1960’s/1970’s and I should be careful with the vintage details. 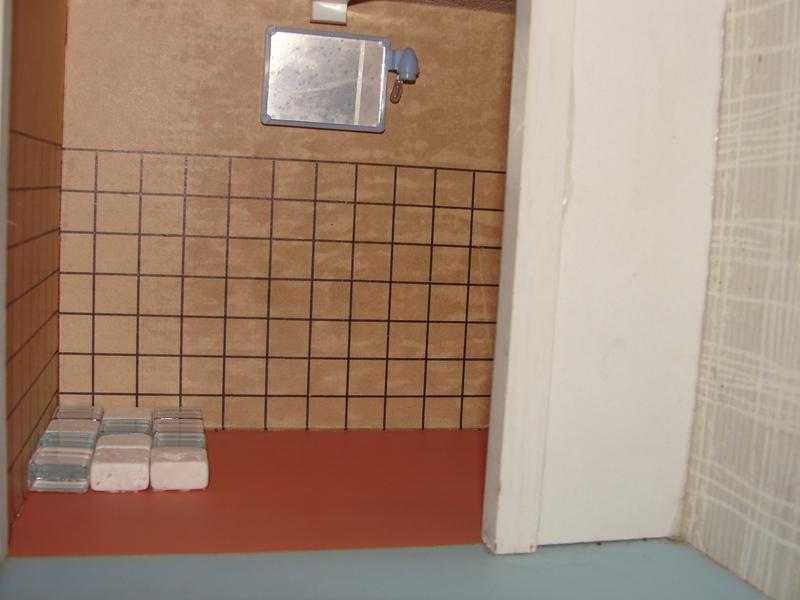 I accepted this interesting information about my dollhouse and with a bit of trepidation, I ever so carefully went to work, using museum putty instead of glue and scrapbook wall paper instead of paint. I started with some wood flooring from large scrap tiles from Home Depot that I cut up into smaller planks and fit together. I only got to two rooms but I think I am going to finish the house with them. The bathroom needed an over haul and so I chose some little stone tiles to lay down to cover up the dated orange floors. 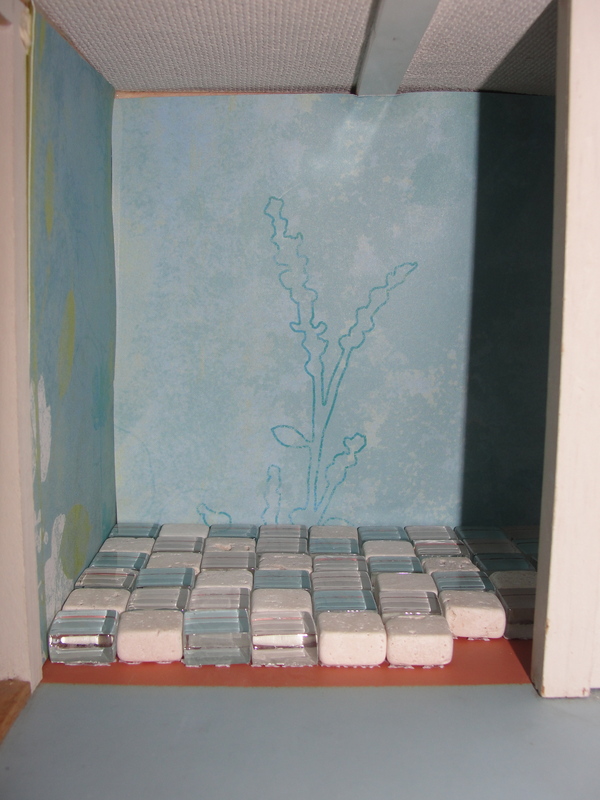 I’m not sure if I like the look of the tiles just yet and so I haven’t puttyed these down. I did add in some wall paper to cover up the bathroom walls and I do like the new blue walls. I will be working on the bathroom some more, but I do like the lighter aura it has now with all the lighter colors. 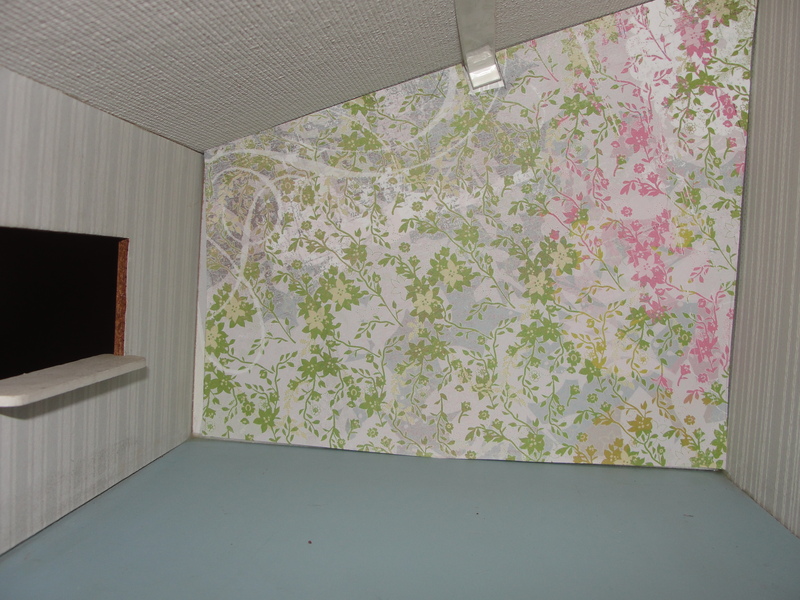 The upstairs children’s bedroom was plain but the original wallpaper was in pretty good shape. I wanted something a little more “baby girl” for the “child’s bedroom” so I went with some scrapbook paper I had lying around. I think the colors of the wall paper go nicely with the blue floors so I’m not sure if I want to lay down wood here? And last but not least I made my first teeny tiny pennant with some vintage pillow case fabric. It was very hard hot gluing these little guys onto ribbon, but it came out pretty nicely and all of a sudden welcomed my imagination into this house that’s coming together ever so very slowly… I was busy favoriting things on Etsy this week and will be scouring the flea market this sunday for dollhouse finds. 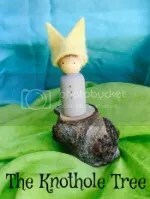 I’m also talking to my engineer husband about putting in some solar power and helping me with a “living roof” I think would look lovely. 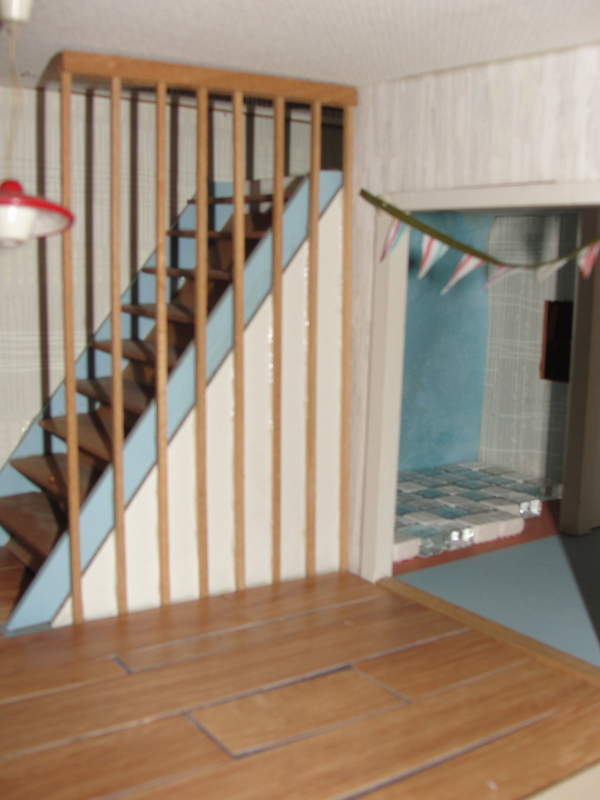 What excitement over a doll house! 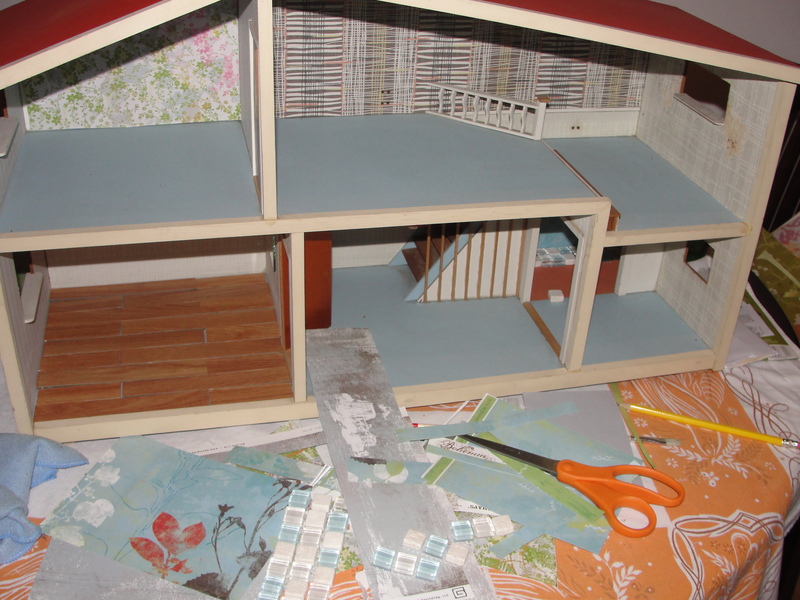 How are your doll house reno’s going? 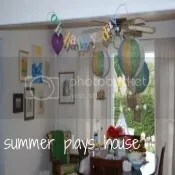 I love your pennant-isn’t it fun playing doll houses! Love where this is going! You really scored on the house.